After general announcements and introductions, the first order of “regular business” includes public speaking for any planning related topic. 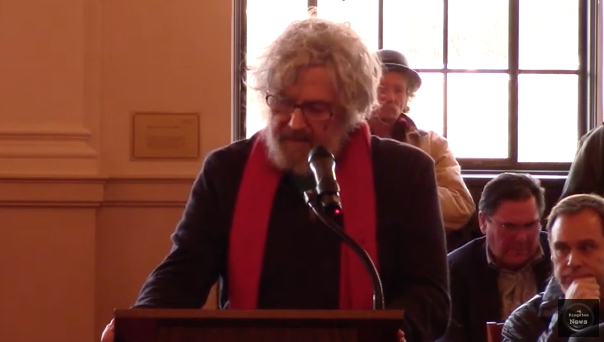 Please plan to keep your comments to 2 minutes or less to accommodate more speakers. 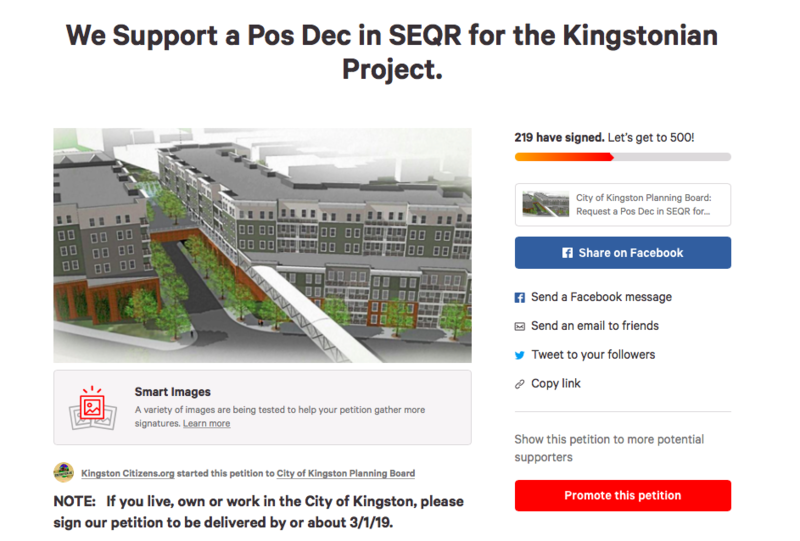 In the meantime, if you are a Kingston resident or business owner, please sign the PETITION to request a Pos Dec and 90-day scoping period. 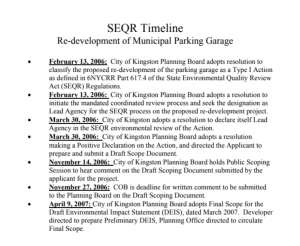 On Monday, March 18th beginning at 6:00pm, the Kingston Planning Board is anticipated to accept their role as Lead Agency for the proposed Kingstonian Project, a Type 1 action in the State Environmental Quality Review (SEQR). 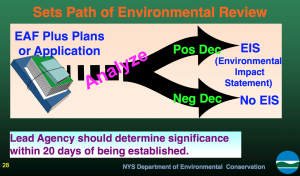 As Lead Agency, they will make a Positive (Pos) or Negative (Neg) Declaration (Dec) determination for the project. 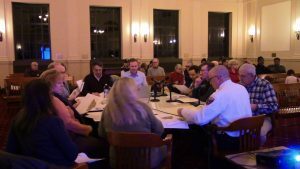 This is a critical moment in determining what the public review process will be for this project going forward. A transparent and inclusive SEQR process is the public’s rightful opportunity to address important concerns in a comprehensive manner. It also establishes a strong framework for communication among government agencies, project sponsors, and the general public. This is NOT a campaign to stop a development. 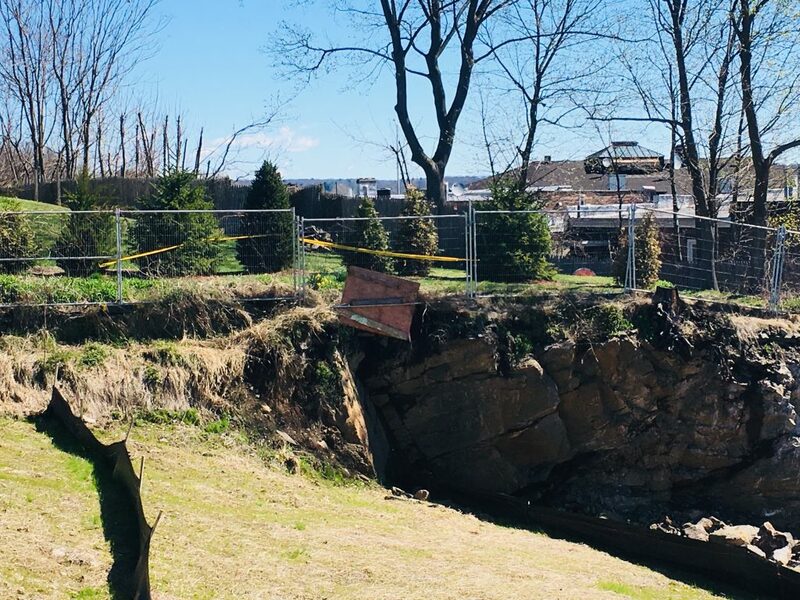 This is about ensuring that whatever gets built benefits the Kingston community to the greatest extent possible and that adverse impacts are avoided or mitigated. Positive Declaration Required for the Kingstonian Project. KingstonCitizens.org submitted a letter to the Kingston Planning Board as Lead Agency (and most Involved and Interested Agencies) in the State Environmental Quality Review Act (SEQR) with support from 194 tax paying residents and business owners in the City of Kingston requesting a Positive Declaration in SEQR. 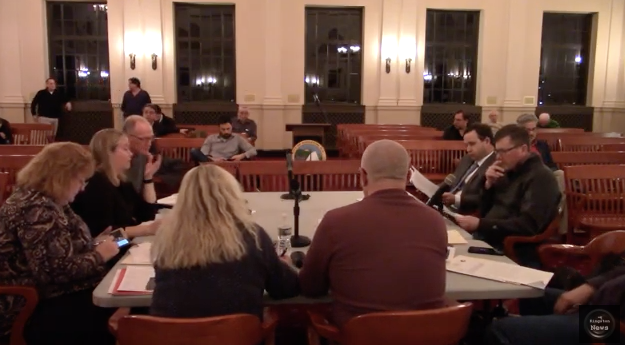 We are still collecting signature to present during public comment of the Kingston Planning Board meeting on 3/18 so keep signing and sharing. 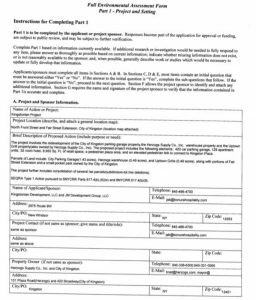 DRI Grant Application (Public/Private project with $3.8m in grant funds and $48m in private funds). 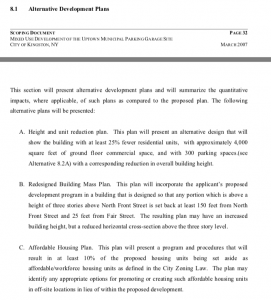 The letter outlines potential significant environmental impacts taken from the Environmental Assessment Form (EAF)submitted by the both applicants Kingstonian Development LLC and JM Development Group, LLC. 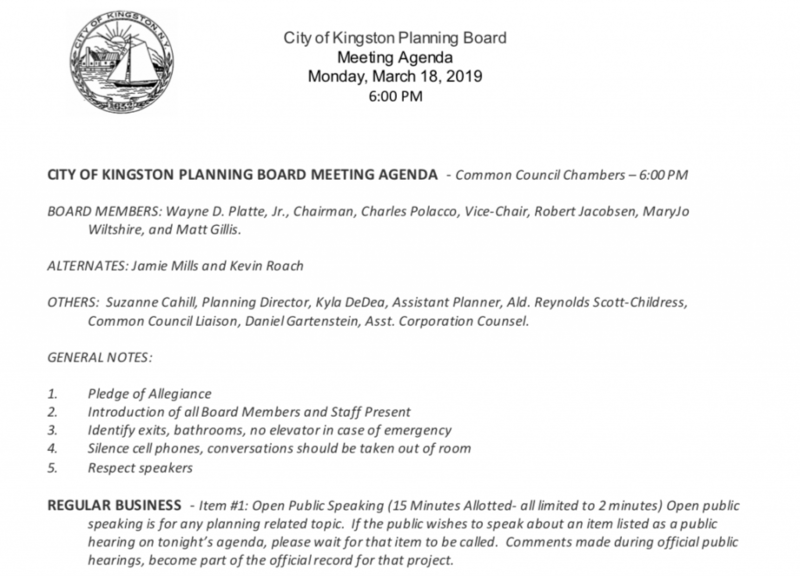 The Kingston Planning Board meets next on March 18th at 6:00pm where it is expected that the Planning Board as Lead Agency will issue a positive declaration and outline its scoping plans. They may also choose to issue a negative declaration, however – the burden will then be on them to prove that there are no impacts rather than the citizens to prove that there are. Residents are encouraged to attend the upcoming meeting to support a Positive Declaration for the Kingstonian Project during public comment. 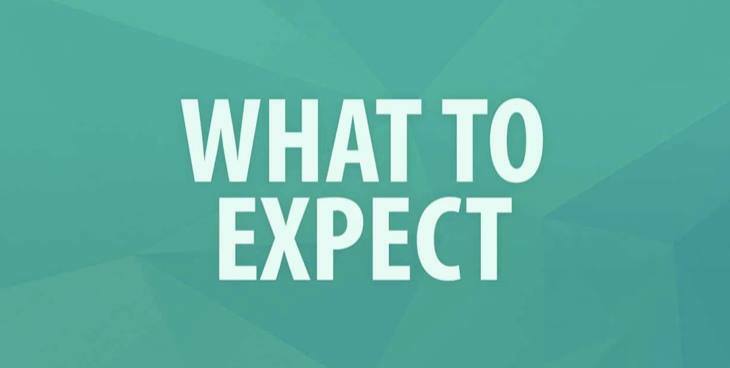 READ: What to Expect: March 18th Kingston Planning Board Meeting and the Kingstonian project.